Specialization Points in Division 2 are points you use to upgrade your specialization of choice – Sharpshooter, Demolitionist, or Survivalist. As you might expect, it’s fairly crucial to farm Division 2 Specialization points. Fortunately, the Survivalist, Sharpshooter, and Demolitionist Specialization points aren’t too hard to come by, if you know what you have to do. With that in mind, we present to you our Division 2 Specialization Points – How to Get guide, in which we’ll give you several best methods to farm your Survivalist, Demolitionist, or Sharpshooter points. 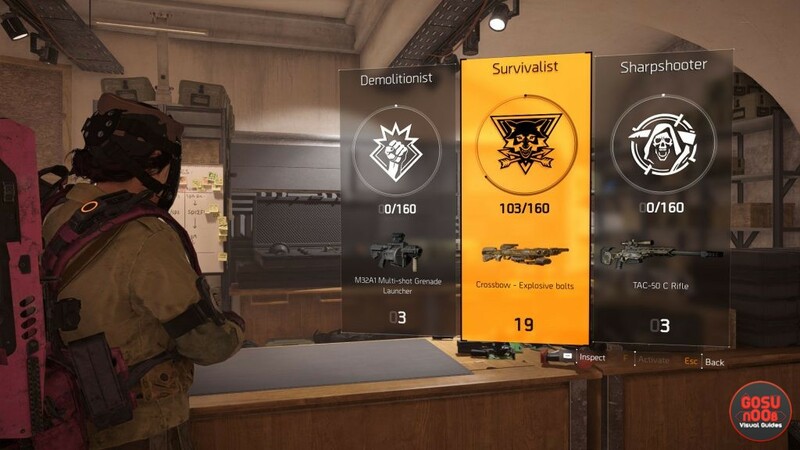 How to Get Specialization Points in Division 2 – Survivalist, Sharpshooter, Demolitionist? To get Specialization Points in Division 2, for your Sharpshooter, Demolitionist, or Survivalist, there are several things you can do. For one, when you unlock specializations in The Division 2, you’ll get three Specialization Points to allocate however you want. After that, you’ll have three Strongholds to re-conquer, each of which has two missions that you have to do beforehand. Each of these missions reward you with five Specialization Points, as does every Stronghold. That totals to 45 points. The next step are regular ole bounties. Each bounty that you complete will reward you with three Demolitionist, Survivalist, or Sharpshooter Specialization Points. The same goes for daily and weekly bounties, the ones that require you to complete missions on Hard or Challenging. Another decent source of Specialization Points in Division 2 are field proficiency caches; although, as far as we can tell, the points are not a guaranteed drop from those. Lastly, another source is taking Control Points, but only at Alert Level 4. That is, by all accounts, absolutely not worth the bother. Those missions are brutal. If you’re only out for points, there are plenty of simpler ways. Speaking of Control Points and their Alert Levels, did you know that you can get the 7.62 extended magazine through those? Head over to our 7.62 Extended Magazine How to Get guide for more info. Or, if something else is giving you headaches, feel free to browse through our other Division 2 guides. Lord knows we’ve got ’em. THANK YOU for making this, there isnt too much info out there about how to get signature weapon points. Im a language Teacher and game enthusiast also! Lol thanks for this article. Helped me a ton. Nice! Glad you found the guide useful! I don’t know if this is from the beta or anoterh copy & paste info, but looking is from 3 days ago i’m thinking if you alredy played the game? You don’t get 15 points, only 3 as you can see too in the screenshot “you” provided. All of the other info is really good. You are correct. This is beta info. We rectified the article.